A wildfire is a raging, uncontrolled fire that spreads rapidly through vegetative fuels, exposing and possibly consuming structures. Wildfires often begin unnoticed and can spread quickly, creating dense smoke that can be seen for miles. Wildfires can occur at any time of the year, but mostly occur during long, dry hot spells in the spring months of March, April and May. Any small fire in a wooded area, if not quickly detected and suppressed, can get out of control. Most wildfires are caused by human carelessness, negligence, and ignorance. However, some are precipitated by lightning strikes and in rare instances, spontaneous combustion. Wildfires in Pennsylvania can occur in fields, grass, brush, and forests. 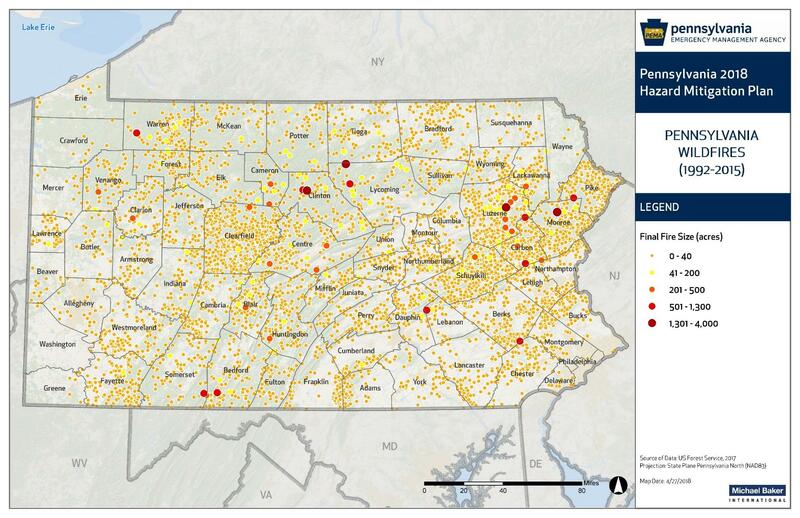 98% of wildfires in Pennsylvania are a direct result of people, often caused by debris burns (PA DCNR, 1999). The DCNR Bureau of Forestry’s inventory of wildfire events shows the annual number of wildfires peaked in the early 1930s, while the annual number of acres burned peaked in 1913 and has declined steadily since the 30s. From 1913 to 2017, the average annual number of wildfires was 1,561, and the average size of wildfires was 36.6 acres. In contrast, over the 10 years between 2008 and 2017, the average annual number of wildfires was 650, and the average size of wildfires was 7.0 acres (DCNR, 2017). It is estimated that five to ten thousand wildfires occur annual in Pennsylvania with northeastern Pennsylvania being the most at risk for loss of life and/or property due to the number of homes at risk for wildfires. Annual occurrence of wildfires should be considered highly likely, however the likelihood of one of those fires attaining significant size and intensity is unpredictable and highly dependent on environmental conditions and firefighting response. Weather conditions, particularly drought events, increase the likelihood of wildfires occurring. Additionally, invasive forest insects can increase the likelihood of wildfires occurring, killing trees and increasing the total wildfire fuel available in wooded areas.